All images used with permission from Aremo Massa. Thanks, Aremo! THE RUN-DOWN: Creator, Artist, Writer. Loves bikes and travel photography. How long have you been working in comics in Philadelphia? I guess since I got here, which will be coming up on 2 years. What brought you here/How long do you plan on staying? Mostly I enjoy the scenery and the cost of living. I’ve always been curious about coming to live here. I plan on staying for as long as I feel like something significant is happening. If I can feel like I’m making some kind of move here, if I can feel like I’m doing what I’m supposed to be doing, whatever that is, then I’ll stay. If I feel like something’s calling me elsewhere, then I’ll try a different state. Do you think the comics scene there is similar to the one here, or are they completely different? Yes, it’s completely different. In my experience it’s been kind of weird, because as I was getting back into comics, I had a hard time finding a community there. So when I moved here, everything amped up more. I was able to meet more people in person, and learn more about the scene. I don’t know if it’s because it took me too long to get interested, or if it’s because I moved, but I never really got that to happen there. What did you do when you moved here to find people? I kind of just got more aggressive about finding my safe spaces…it made me get more aggressive about finding out where all the shops were, and going to check them out and introducing myself, and to try harder. I went to all the other shops before I went to Atomic. Once I met Atomic and met Joe (Turner) - that’s where I’ve made most of the friends I’ve made here. I didn’t want it to be the same thing as New York, where I just ended up not really knowing anyone or doing anything, and just working in private, so I knew I had to get more aggressive about it. Do you feel like the Philly scene has affected your work at all? Not so much in subject matter, but definitely in having more people to talk to and having that energy around all the time. I feel like a lot of us tend to work really really hard alone, and don’t have enough forces bouncing around. But then going out and talking to people, it just gets more ideas out in the air, and more creative energy and more things to think about than I’ve ever had before, so it definitely feeds into everything I’m doing. It keeps me enthusiastic, it keeps me motivated, even if I’m not doing any sort of big production. You’ve been working on the Remnants, for…how long now? Yea…it was never supposed to be this long, but I didn’t know what I was doing, and I thought it was a simpler story than it was, and then it just got better and better and more involved and intricate. And then I started working a new job, so the timetable never really works out as fast as you think it is, and now here we are in year 6. That’s good though, right? That it turned out to be better than you thought it was going to be. Yea. For the most part. I’m glad I haven’t given up on it. I really wanna finish it, but I’m getting to the point where I wanna do something else at the same time. I wanna find a way to get something published. Do you have a dream project that you’d like to work on? You mean besides The Remnants? Yea. Unless that’s The Remnants. It mostly is. I mean the goal is to get that finished, and have it be done, be really polished and look professional. Aside from that…I don’t know. I’d dream of work on either Rumble, or something Teenage Mutant Ninja Turtle-related, cause I’m obsessed. If I can do that, then I could do that and then die. Sort of in a similar vein, do you have a dream location to work out of? If money was no object, where would you wanna wake up and work every day? Hmm…if I had to pick one place…I might say that it’s California, since I went there recently, and I was like, “This beach life I can do.” It wasn’t just tacky beach views. It was nice beach views. Venice. That was the place that stuck out to me. Do you think you’d ever move back to New York? I would, but kinda like going back to one of the other questions, something would really need to call me back there. I wouldn’t do it just to do it. I’d rather move to someplace I haven’t been to yet. Maybe even just relocate in Philly. What are some things that you like about working in the Philly comics scene? I’m gonna be one of the weird people that you’re interviewing, ‘cause I don’t know if I really work in the Philly comics scene, even though I’m really interested in it and I’m trying to get a foothold in it. I just do my comic and happen to work in Philly, and I do work in freelance illustration sometimes. I guess the overall vibe here is kinda indie-friendly. You can do a lot of underground stuff and it not be completely ignored. I feel like everything here has a following of some sort, and it’s interesting. What about things that you don’t like about working in this city? Is there anything in particular that doesn’t work well with being an artist, specifically comic artist? I haven’t done it in enough places to feel like it’s a Philly-specific problem, but I feel like comic art and anything close to that in general - as much as there’s a niche fanbase, and it’s indie-friendly - largely is still kind of niche. Your fanbase is probably gonna be like 60% artists, and the rest of them is everyone else. But it’s still a small amount compared to all the other kinds of media, like publications and books and stuff. It’s such a small thing to be interested in at all, that that makes it challenging. By and large, people don’t care. And the people that do care, you probably already know. It’s a small circle of trading work back and forth, the same $20 bill going around at our tables. “We tabled together, let me buy your stuff!” Then you buy my stuff. That’s awesome. Comics are still growing, but they haven’t grown enough. Since, like you said, most of us support each others’ work, do you have any favorite artists right now? Who inspires you on the local level, or who do you look at? I look at stuff by Rebecca Kirby a lot. I really like her work. Yea, she’s my favorite. She just spews stuff out. I’d say she has three different, solid styles, and they’re all very distinctly her. You can tell that she really likes what she does, and she’s proud of her work. Then there are the bigger people that I’m obsessing over, that make me want to stop drawing. They’re out in the industry, and they’re doing great work, and I love their work - like everyone involved in Rumble. That’s really the top one for me right now. I keep mentioning Rumble and Teenage Mutant Ninja Turtles, cause those are my top favorites. So, like, Mateus Santolouco. And Extremity! I just got hip to that artist (Daniel Warren Johnson), and now I follow them, and their stuff is just breathtaking. Speaking of which, what about social media? Does that affect how often you produce work? Does it make you work more, or do you feel like it’s a scourge? It’s a little of both. I definitely scaled back on which platforms I use. I feel like some are more encouraging than others. I had a Twitter account for like, forever, and probably in the last 6 years, I’ve not mastered it, so I just don’t really use it. I think when I moved here, for following a lot of the actual artists that I’ve met, Instagram is really the best tool for visual arts, and it’s made me really excited, actually. Before I’m about to draw something, I’ll usually scroll down my feed, ‘cause I curated it for art-related things. All the artists I know and love, I’m following them anyways, so all I see is their stuff and stuff that will inspire me. So I’ll scroll my feed…try to engage, and not just “like” stuff, but comment about things to get conversation going. As an artist, do you prefer to work digitally, or if you had time, do you think you’d do traditional? I like a mix. Everything I’ve been doing with The Remnants has been a learning process, so I had done a lot of it traditionally by hand for the first two issues, at least for the pencilling and inking. And then, I changed to inking digitally in Illustrator. I did that, thinking it was gonna be my style, and now I don’t like it anymore. The stuff I’m working on now is penciling by hand, hand inking with a Bic pen, and then going over it for bolder lines with a Tombow brush or something, and I really like that. Bu then I still prefer to color digitally. I do have a specific coloring style that I like, and that’s always gonna happen digitally. Unless it’s for, like, a pinup or something. I like the mix of all that. When you show your work to other people around here, do you feel like it’s pretty well received? Do people jump to give you pointers? I know a lot of the artists here stay in our little pockets. Did anyone, when you moved here, jump to show you around? In my experience, it’s mostly been a “figure it out on your own” kinda vibe, but with the general encouragement to maybe just come out to more places where those people would be. Just be around them, and see what naturally happens. But, like, be around. I try to go and be in places where all those people are, no matter what level they’re at, just to have conversations happening all the time. Photography. If I didn’t know how to do anything else, I’d make a big push for that. But that’s, like, back of the list. And then music. I played guitar and sang in a band. Did you have cool hair? Hmm. Not really. I grew it out after. I think I thought I was gonna get back into it, so I wanted to have the cool hair and, like, re-emerge. Like a rock star. And it just never happened. But I went to school for art. I’d always been interested in comics. And in college, people pushed me into graphic design, like, “Oh, you can draw. You’d be good at this.” So I did that, and then that kinda killed my comics vibe. Now I don’t mind it, but…I’m kinda over it. I think if I weren’t doing comics, and I wasn’t doing music, I’d wanna do travel photography. I’m more excited about taking photos when I’m seeing new places. I don’t really like taking pictures of people all that much. I wanna see something new, or I don’t care. Do you have any projects you’d like to promote? Definitely The Remnants. Everything I’m working on is top secret, so it’s probably gonna be about a year before I show new stuff [for Remnants]. But I’m trying to find other things, so I’m available for collaborations, like coloring or drawing - as long as it’s short stuff. To keep up with Aremo, follow his comics and illustration at @theremnantsofficialcomic and his photography at @broadcastquality. 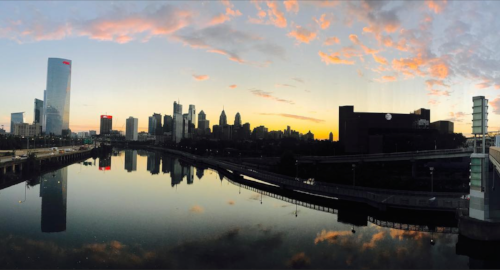 Philly’s always been a good “art city."